There are many benefits for an athlete to attend camps and clinics, but matching what is an appropriate camp to an athletes age and experience level can prove daunting. This decision is made more difficult due the sheer volume of camp opportunities out there. So how do you pick what camps or clinics are best for your son or daughter? I am asked this question every year by families, and generally speaking it comes down to a player’s experience level and age. There are several purposes for attending camps that an experienced athlete should consider. Camps and clinics can be great opportunities for an experienced athlete to keep skills sharp during breaks in their season or in the off-season. They can also help an athlete who is attempting to change positions get necessary repetitions to gain confidence and consistency. If you are uncertain about your athlete’s experience level or areas of focus don’t fret! Your athlete’s coaches and club administrators should be able and willing to guide you toward areas in your athlete’s game that they should be spending time on. Some organizations will also allow you to come in and get an evaluation to help direct your time and energies toward the best possible path for your son or daughter. In general, experienced club players 13 years of age or older should almost always be investing their resources into camps or clinics that are positional or skill focused. Just remember all camps are not equal. It is very important to be looking for camps and clinics with qualified and experienced coaches, and a camp program that has a great reputation of caring about athlete development. So, do your homework! Less experienced and younger athletes are still learning the game, and as such should not be as focused on specialization. General Skill Camps or All-Skills camps are the best bet for these athletes. These camps allow athletes to experience everything the game offers. These general camps also ensure an increase in volleyball IQ as well as more understanding of the game. Typically, athletes 12 years old and younger are best matched with an All-Skill Camp. As you do your homework on these types of camps I encourage that you research coach to camper ratio, and whether the camp ability groups the athletes. You should always be looking for a coach to camper ratio between 1:6 to 1:8. The lower the ratio, the more repetitions for your athlete. If they can’t tell you what the ratio is, that is a bad sign. The reason why ability grouping the athletes is important is so that you again will maximize repetitions for your athlete. An athlete that is clearly ahead of other athletes in their group will most likely be held back as the coach needs to explain, or remediate things for the other athletes more. This will reduce the number of repetitions for that athlete who does not need or require the remediation. Don’t be afraid to ask the hard questions! We are excited to be sharing our camp series with you this season. 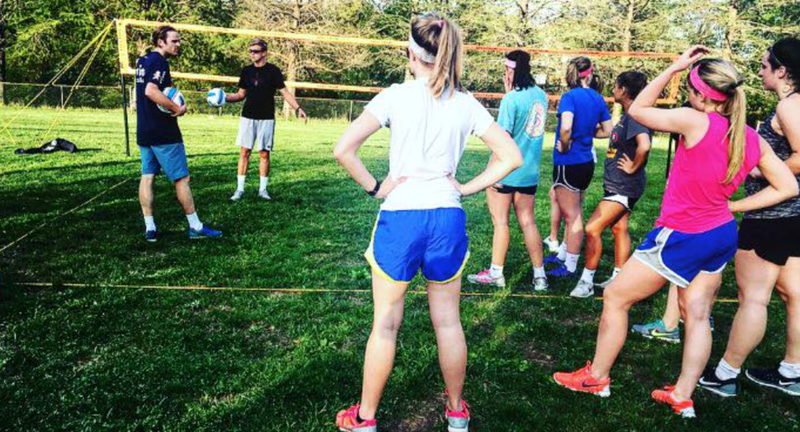 As the leader in both indoor and outdoor camps in the metro area, we are always looking to provide our camp participants with the best coaching to create an environment for your athlete to learn and improve. Our Camp Directors do this as their profession, but it is also their passion. They love training athletes. We hope you will check out our indoor and outdoor camp series, and join us on the hard court or the sand this summer! For information on our Summer Camp series, please check out our Camp Page, http://www.hpstl.org/camps, or contact our Camp Coordinator Tony Stratman at tony@stratmansports.com.